Corvida Medical’s Halo® Closed System Transfer Device (CSTD) has been shown to reduce surface contamination in both the mixing and administration of antineoplastic hazardous drugs (AHDs) in a thirteen center US site study. The results of the study, which was made possible through an NCI-Funded SBIR grant, were revealed in a poster presentation on March 30, 2017 at the annual Hematology Oncology Pharmacists Association annual conference. The Poster Presentation, Assessment of a New CSTD at 13 U.S. Cancer Centers was authored by Timothy G. Tyler, PharmD (Comprehensive Cancer Center, Desert Regional Medical Center, Palm Springs, CA); Sylvia B. Bartel, RPh, MPH (Dana-Farber Cancer Institute, Boston, MA); and Luci A. Power, RPh, MS (Power Enterprises, San Francisco, CA). The thirteen study sites were recruited from National Cancer Institute (NCI) Designated Cancer Centers and the members of the Association of Community Cancer Centers (ACCC) in the US. Corvida Medical, a firm based in Coralville, Iowa, obtained FDA 510(k) clearance for the Halo Closed System Transfer Device, a product designed to prevent clinicians from being exposed to hazardous medications such as those used in chemotherapy. The system provides guaranteed air-tight and leak-proof connections to vials and was designed to have fewer pieces and fewer steps to connect them. The system features swabbable raised seals and also helps prevent needle-stick injuries. Read the rest of the story by MedGadget. 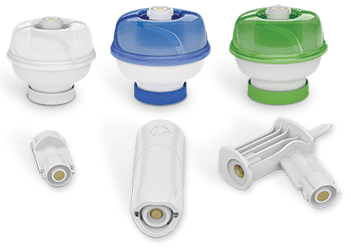 Emerging medical device firm Corvida Medical® has received a 510(k) clearance from the US Food and Drug Administration (FDA) to market its first product, the Halo Closed System Transfer Device (CSTD), to protect health care professionals from exposure to hazardous drugs. The device received an ONB product code classification from the FDA, demonstrating no escape of hazardous drug or vapor concentration, no transfer of environmental contaminants, and prevention of microbial ingress. July 29, 2015 – Coralville, Iowa – Emerging medical device firm Corvida Medical® has received a 510(k) clearance from the US Food and Drug Administration (FDA) to market its first product, the Halo Closed System Transfer Device (CSTD), to protect health care professionals from exposure to hazardous drugs. The device received an ONB product code classification from the FDA, demonstrating no escape of hazardous drug or vapor concentration, no transfer of environmental contaminants, and prevention of microbial ingress. Millions of health care workers are exposed to hazardous drugs every year. This exposure can have serious health effects, including cancers, infertility, genetic mutations, and other adverse health effects. CSTDs are designed to protect health care professionals and patients from exposure to these drugs by mechanically prohibiting the transfer of environmental contaminants into the system and the escape of drug or vapor concentrations outside the system. Corvida’s Halo CSTD is a novel concept in hazardous drug protection. Halo provides health care professionals with an air-tight and leak-proof closed system that is easy to use, with fewer pieces and fewer steps. It features a simple design that enhances comfort, while ensuring compatibility with existing work procedures. The Halo will be commercially available in late 2015. Corvida Medical® innovates intelligent technologies that are designed to represent smarter solutions for the safe handling of hazardous drugs and excellence in design. The company addresses the problems inherent in current methods and develops smarter, simpler solutions to improve safety, productivity and quality for providers and patients. Corvida Medical is starting a research study for its technology to safely handle hazardous drugs. It’s in the process of recruiting additional cancer centers to join the multicenter study designed to evaluate improvements to its first medical device, a closed system transfer device called the Halo. The study is backed by almost $5 million in grants from the National Cancer Institute as part of a series of Small Business Innovation Research grants. The company hopes to gain FDA clearance for and to launch the Halo device next year. The preparation and delivery of chemotherapy puts more than 5.5 million U.S. healthcare workers at risk for exposure, Corvida estimates. The potential health problems resulting from this exposure include cancer, reproductive and developmental problems, as well as other irreversible events that can occur after even low-level exposures, according to Occupational Safety & Health Administration (OSHA) and the National Institute of Occupational Safety & Health (NIOSH). “The NCI SBIR study is a significant effort by the company to get leading cancer institutions in the U.S. to explore applications of Halo and to demonstrate forward movement in safe handling,” Kent Smith, president and CEO of Corvida, said in a statement. The Halo is a closed system transfer device (CSTD), which mechanically inhibits the transfer of environmental contaminants into the system and the escape of hazardous drugs or vapors outside the system. The device is designed to be an improvement upon existing CSTD technology, which can leak liquid or vapor at connections between components such as drug vial adapters, syringe and line adapters, and bag spikes. Corvida is a startup out of the University of Iowa Research Park and is backed by investors including DVG and Linseed Capital. Corvida Medical®, an emerging medical device corporation creating technologies to ensure a safer environment for healthcare providers and their patients, has launched a multi-center research study. Funded by the National Cancer Institute (NCI) as part of a series of Small Business Innovation Research (SBIR) grants, the aim of the study is to demonstrate the improvements that Corvida’s new technology could bring to the safe handling of hazardous drugs. Coralville, IA – December 5, 2014 – Corvida Medical®, an emerging medical device corporation creating technologies to ensure a safer environment for healthcare providers and their patients, has launched a multi-center research study. Funded by the National Cancer Institute (NCI) as part of a series of Small Business Innovation Research (SBIR) grants, the aim of the study is to demonstrate the improvements that Corvida’s new technology could bring to the safe handling of hazardous drugs. Corvida is now seeking study participants to join the country’s leading cancer centers in a one day evaluation of the medical devices used to improve safe handling of hazardous drugs. Over 5.5 million healthcare workers are at risk of exposure annually to hazardous pharmaceuticals during the preparation and delivery of chemotherapy. Studies have shown that exposure to these hazardous drugs can cause serious health problems, such as cancers, reproductive and developmental problems and other adverse events that can be irreversible even after low-level exposures, according to the Occupational Safety & Health Administration (OSHA), National Institute of Occupational Safety & Health (NIOSH), and Joint Commission. The research partners involved in this study represent key opinion leaders in the field of oncology pharmacy and nursing who continuously pursue advances in cancer care and the processes used to deliver that care to patients. The Corvida NCI-funded SBIR study will evaluate improvements that the company’s Closed System Transfer Device (CSTD) technology could bring to the safe handling of hazardous drugs. NIOSH has defined a CSTD as a drug transfer device that mechanically prohibits the transfer of environmental contaminants into the system and the escape of hazardous drug or vapor concentrations outside the system. The NCI has awarded a series of grants totaling just under $5 million to Corvida Medical® in full support of the company’s initiatives to make cancer care safer via a proprietary suite of patented medical devices, including most recently a $3 million NCI Bridge Award. Grant funding provides sites with payment for participation as well as opportunities to collaborate in publication of findings. Corvida Medical® is accepting applications to participate in this NCI-funded SBIR study opportunity. Interested applicants can find out more by visiting CorvidaMedical.com, emailing research@Corvidamedical.com, calling 800-604-2235, or visiting the company at the ASHP Mid-year meeting in Anaheim, Booth 1481 from December 8-10. Headquartered in Coralville, Iowa, Corvida Medical® innovates intelligent technologies that represent the next generation of excellence in safe handling of hazardous drugs. The company addresses the problems inherent in current CSTDs and develops smarter, simpler solutions to improve safety, productivity and quality for providers and patients. Corvida’s first medical device, a novel new Closed System Transfer Device ‘the halo’ — will be available in 2015. The Halo is not currently cleared for sale in the U.S.